The short answer is yes, but why? With 70-90% of Australians suffering from lower back pain at some point in their lives, combined with evidence that 68% of 40 year olds and 80% of 50 year olds have some level of disc degeneration. Throw all that in with the sedentary nature of our current lifestyles, we need to take better care of our backs. We all know that exercise and movement is better for us. Years ago, bed rest was the common prescription for lower back pain, now your doctor and your osteopath will encourage you to keep moving. Obviously there isn’t a lot of moving going on when you are sitting. But then again there isn’t a lot of movement with standing either. What you will find is that if you sit for too long, your back may become sore. If you stand for too long the same is also true. So why will a standing desk help my back? The important thing is to constantly change postures so we are varying the stresses on the back. I find that patients with lower back pain who walk regularly at the same pace can tighten and become sore as their walk progresses. When I encourage them to vary their pace throughout the walk, they find they can walk for longer with less discomfort. It is the variety and change in posture combined with movement that helps your back. If you apply this same theory to your desk set up at work or at home, having a desk where you can both sit and stand will make you change postures and vary the stresses on your back, whilst adding in some movement to your routine. So if you decide to invest in a standing desk how do you incorporate it into your work life? 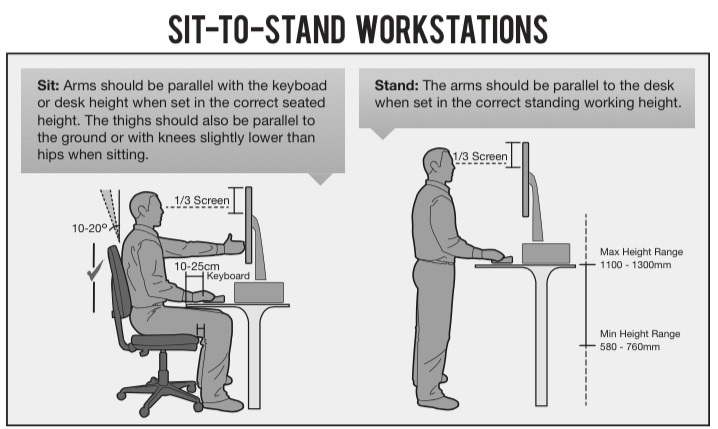 Firstly make sure it is set up correctly for you, don’t forget about the importance of ergonomics (even if you don’t get a standing desk it is always worth reassessing your desk set up, especially at home). Ideally have both a standing and sit down station or a desk that moves up and down. Like you would with any new activity start slowly, spend 30 minutes sitting, then 15 minutes standing. Then slowly increase your standing time. I believe it is good to change postures every 30 minutes. So the short answer is yes, a standing desk could be worth it for you, but the key point is to vary your posture and position every 30 minutes if you are desk bound.